Looking for a decadent treat? 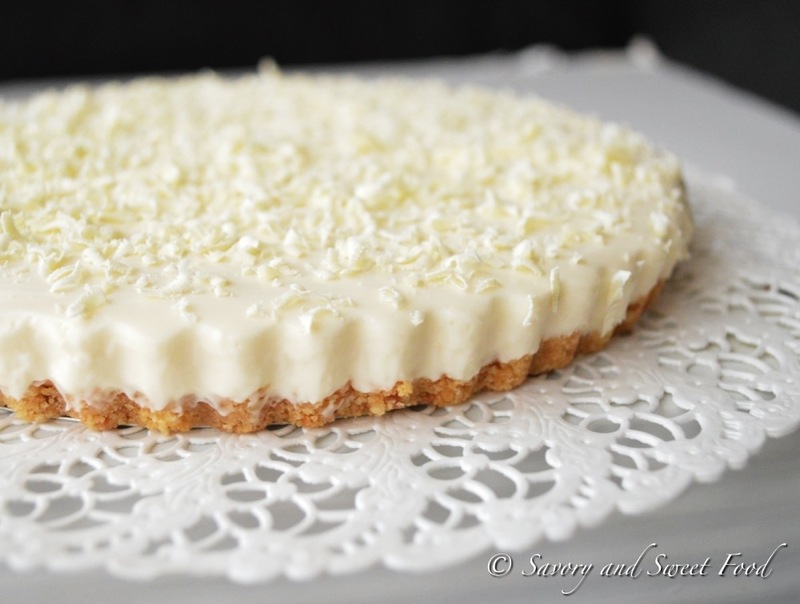 Indulge in this creamy, smooth and rich white chocolate cheese cake. I have the confidence to describe this recipe as “perfect”. 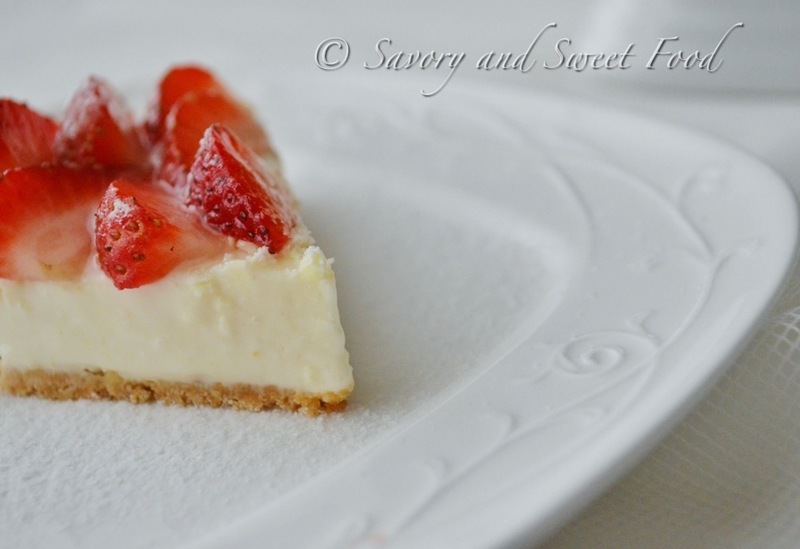 Because this is simply the best, one of the most wonderful cheesecakes I have ever had, and have ever made. It has to be, as i got this recipe from India’s most loved chef, Sanjeev Kapoor’s website. Try making this scrumptious cheesecake to make a show-stopping end to any party. Enjoy! 1. 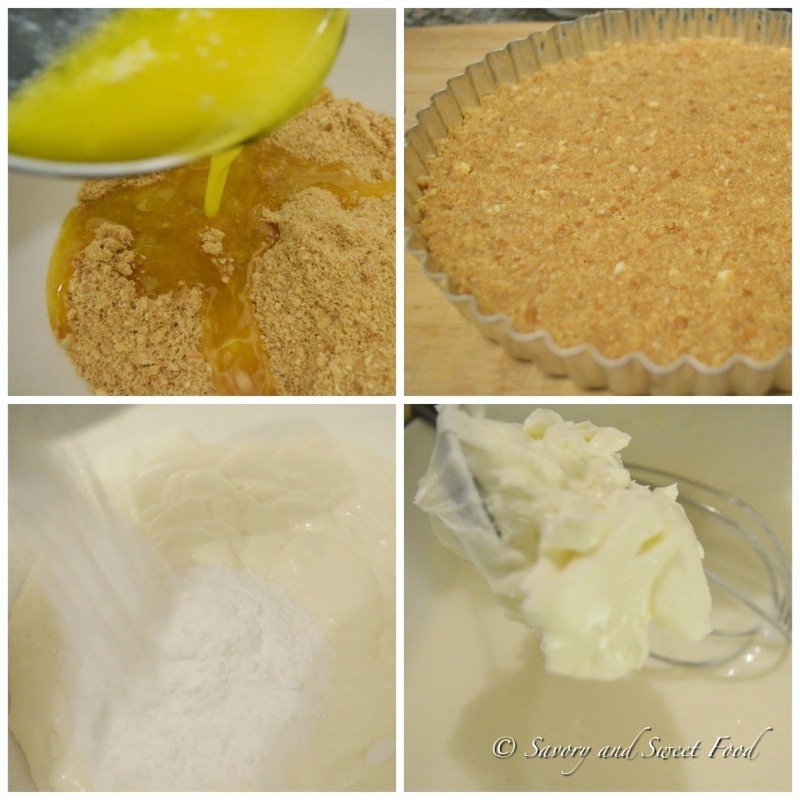 Butter a 71/2 inch tart tin with removable bottom. 2. Crush the biscuits and put them in a bowl. Add the butter and mix. Line the tin with this mixture and press well. Keep it in the refrigerator for fifteen minutes. 3. Mix gelatin with two tablespoons of water and melt it in the microwave oven for forty five seconds. 4. Take fresh cream in a bowl. Add castor sugar and mix. Add vanilla essence and cream cheese and continue to mix. 5. 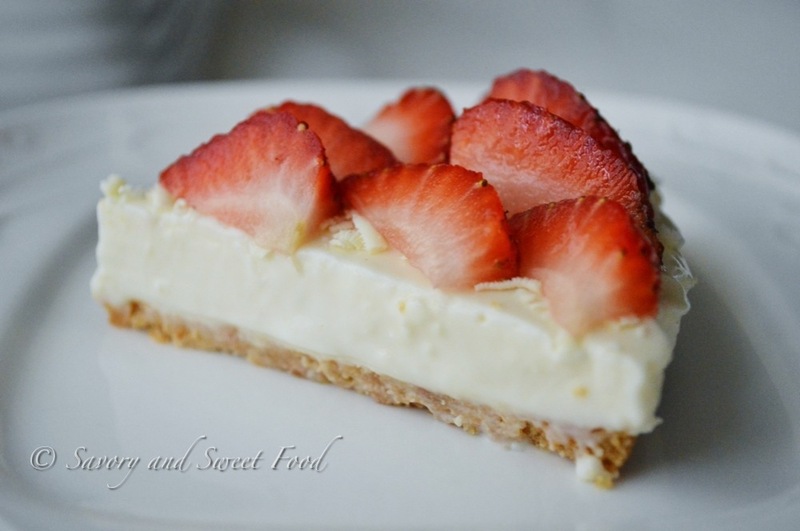 Melt white chocolate in the microwave oven at 60% for one minute. Whisk well and add it to the cream and cheese mixture. Mix well. 6. Pour the melted gelatin through a strainer into the above mixture and mix well. 7. Pour this mixture over the biscuit base in the tin. Let it set in the refrigerator for 4-5 hours. 8. 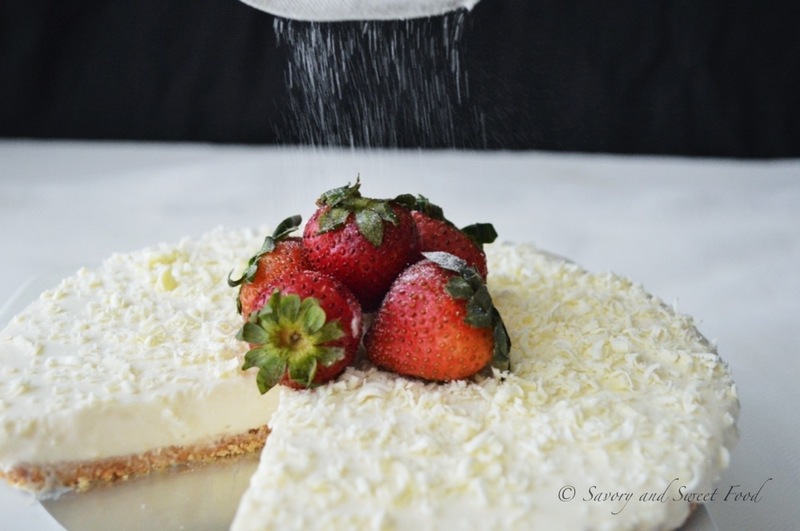 Sprinkle some grated white chocolate over the top and top with strawberries. 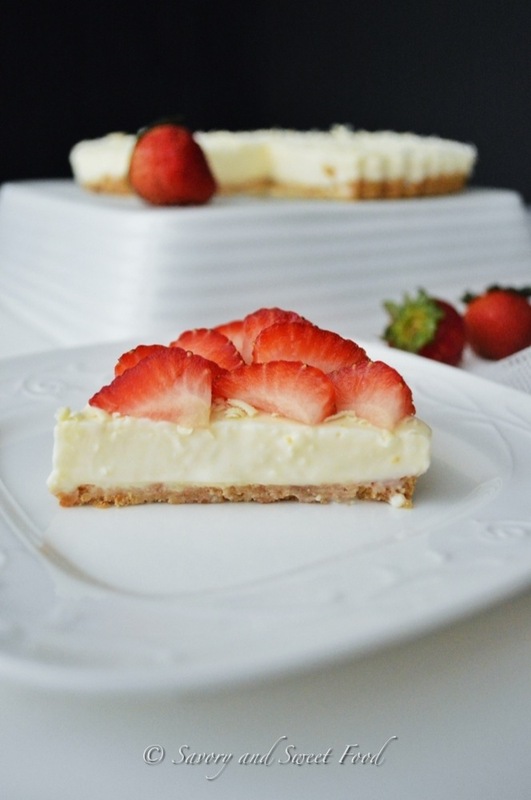 ✔ Do not substitute the fresh cream with whipping cream. I used thick cream. ✔ Do not pour very hot gelatin into the mixture. Let it cool a little bit. ✔ I crushed the biscuits in mortar and pestle. 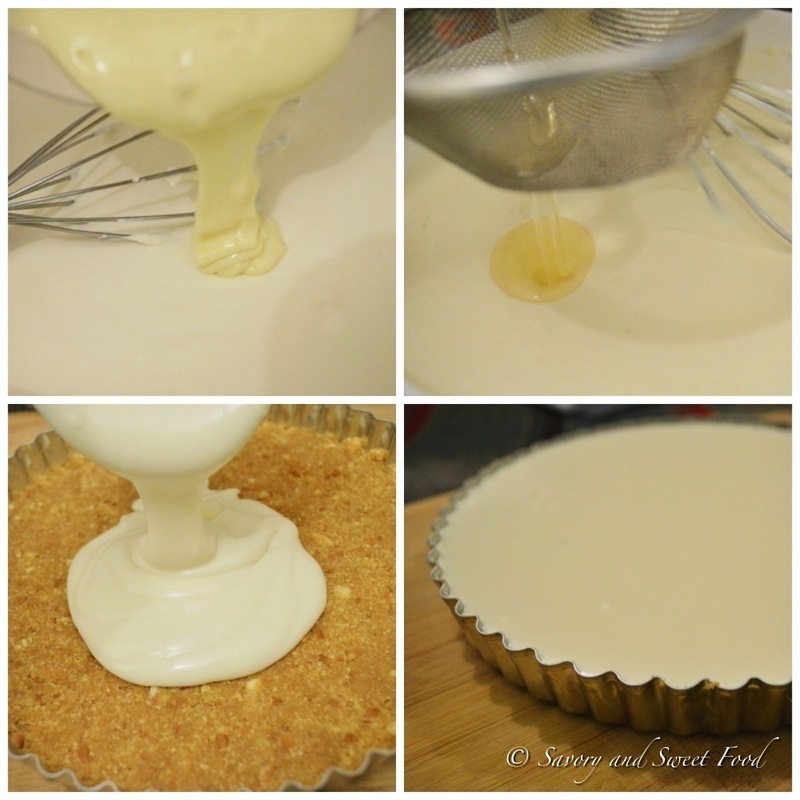 ✔ You can either use a springform pan or a tart tin. Butter a 71/2 inch tart tin with removable bottom. Crush the biscuits and put them in a bowl. Add the butter and mix. Line the tin with this mixture and press well. Keep it in the refrigerator for fifteen minutes. Mix gelatin with two tablespoons of water and melt it in the microwave oven for forty five seconds. Take fresh cream in a bowl. Add castor sugar and mix. Add vanilla essence and cream cheese and continue to mix. 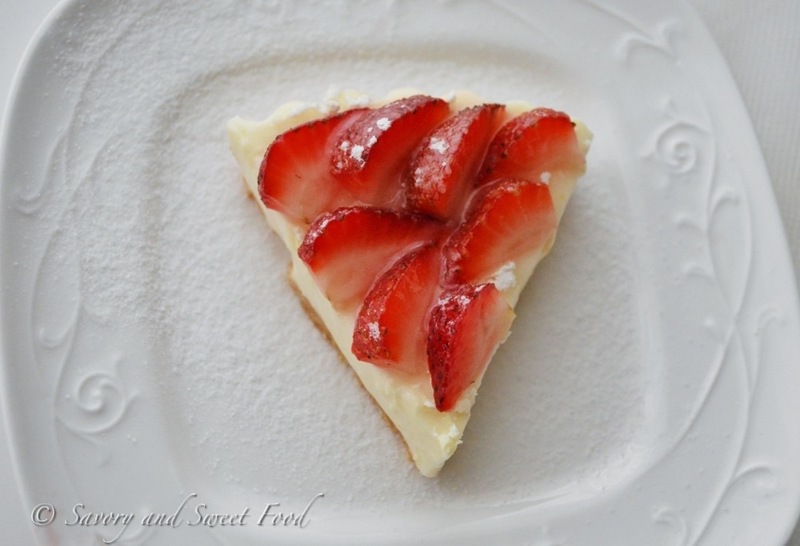 Melt white chocolate in the microwave oven at 60% for one minute. Whisk well and add it to the cream and cheese mixture. Mix well. Pour the melted gelatin through a strainer into the above mixture and mix well. Pour this mixture over the biscuit base in the tin. Let it set in the refrigerator for 4-5 hours. 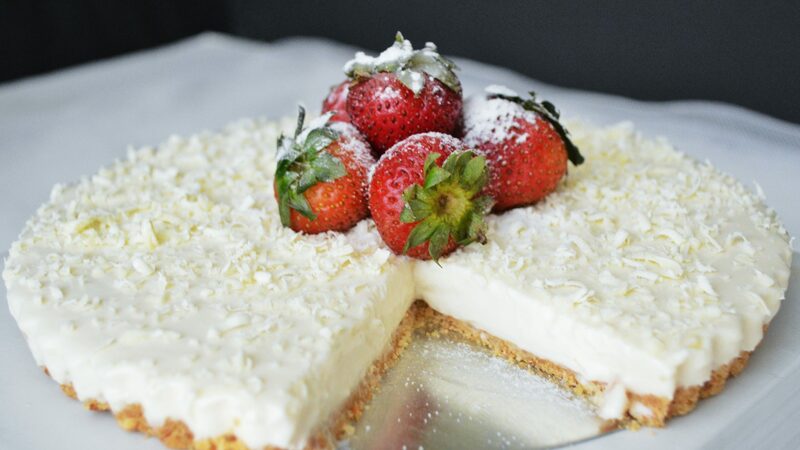 Sprinkle some grated white chocolate over the top and top with strawberries. Try out this one too guys! 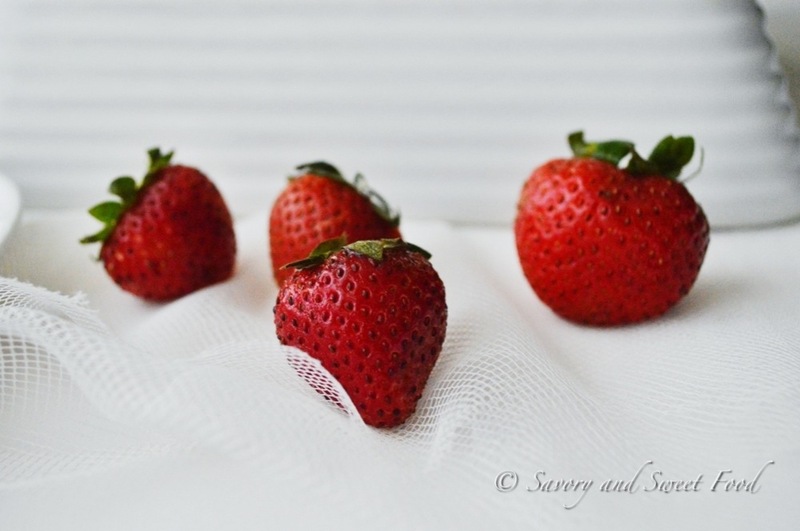 One of my very good friend, Sadiya Gafoor shared this recipe with me. It tastes great. For the base, process the biscuits and sugar. Then just melt butter in microwave and to that dump the sugar and biscuits and mix. Press down this layer in bottom of your pan. Leave this in the fridge so set for atleast 15 minutes before u add the cheese layer. Once biscuit layer is set add the cheese layer on top and put back in fridge to set. 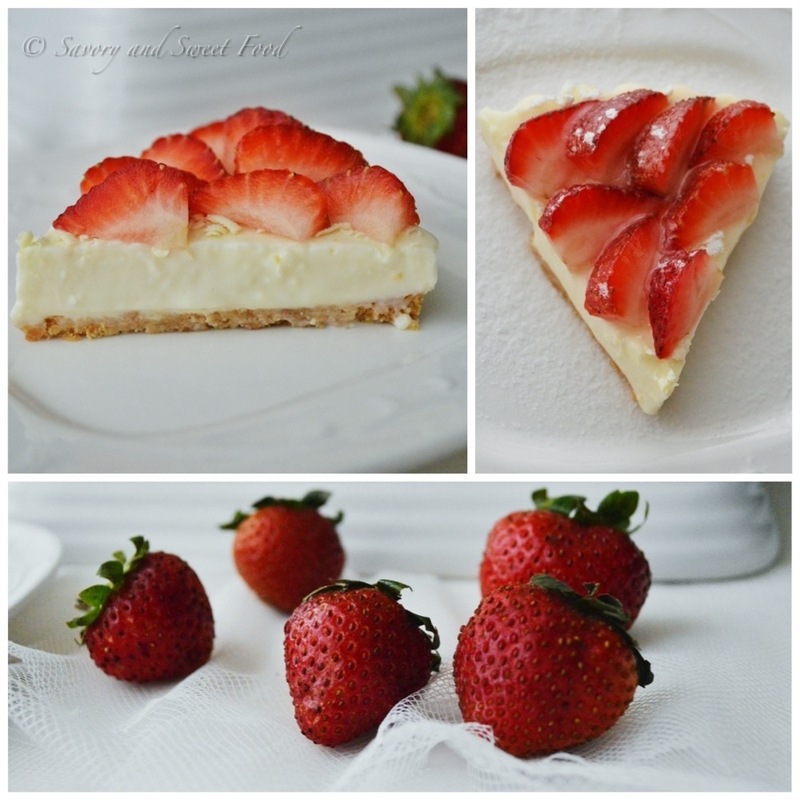 Use strawberry pulp/ crush For topping. A thin layer of jelly on top is also good, that will also hold in this recipe. I love this cake of yours. I have 6 packets of cream cheese in my fridge right now and I’m certainly going to treat myself to this wonderful creation. Thanks for sharing. I have bookmarked it! Wish you a pleasant weekend! What is the difference between fresh cream and whipping cream and where do I get this fresh cream? Please let me know. I’m a bit confused!!! Hmmm fresh cream is thicker than whipping cream. Just search for thick cream in the supermarket refrigerator section. Breakfast cream will also do. Hope this helped. I will try and search then give you a feedback. Thanks for responding. I don’t know if I have ever seen breakfast cream?? anyway will let you know what I find! Hope you can find it. Do lemme know k.
Lovely recipes and stunning pics. I am your newest follower. hey m so sorry..lot f doubts,……….i dnt hv icing sugar…any substitute? nd can v use ny normal white choco or nly cookg ones? Would like to know what size tart pan did u use ? I love white chocolate. this sounds great! Can any cream cheese brand be used……. Yeah of course you can use any brand. I used philadelphia brand. Helo sadia…jus loving all ur recepies…i wanted to know in ur recepie if v can use strawberry jelly on top instead f grating white choclate ? without any change in the other ingredients? Yeah go ahead! You can add whatever topping you like. Jelly would be great. Just make sure you don’t add hot jelly on top. salaam sadia..thinking of makin this recipe for a party soon..just have some doubts though..dyu use philadelphia cheese? if so could you pls tell me how many pkgs u use? coz am not too sure how many would constitute a cup nd a half and since they dont come too cheap wouldnt want to buy any more than needed…also is the texture of this cheesecake more set nd firm or more pudding -like? Ooooh im soo sorry !ehnaz for replying soo late. Is the party over? You made the cheese cake? How was it? Sorry once again. Hello Savita! You can use agar powder or carrageenan instead of gelatin.